being diabetic, am getting Headache in the middle of the head once I become hungry. What could be the reason? Is this due to thirst/due to acidity? How to control my hunger situation.? First of all, I would ask to calm down; nothing good comes from being in stress. Furthermore, if you are stressed, your blood sugar would go up (even spike) and you won't be able to manage it. Now, coming to your problem. This is nothing to be worried about as it is normal to have such reaction when you are hungry. In fact, this can occur when you are extremely hungry, or you post-pone your meals due to your daily activities. 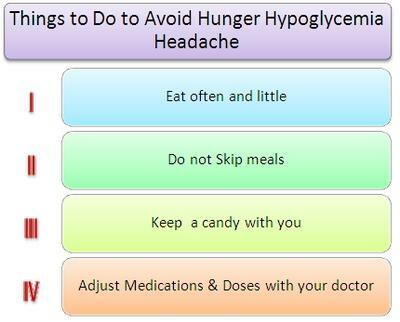 The reason you are having such headache is called "hypoglycemia". Your brain is not supplied with enough glucose (its basic nutrient) and is giving signal to give it the "food" it needs. In addition, while not much glucose (sugar) is supplied to body cells, our body reacts with hypotension (low blood pressure). This is because, our "clever" body wants to conserve the energy it already has until he gets the extra supply. Now, this is a very common situation of diabetics, particularly when they are taking lowering sugar drugs. What you can do to control such hunger situations? So, in this way, you won't let your body suffer of hypoglycemia. - Do not let skip your meals. - Keep a candy with you. When you notice such symptoms as headache or being shaky or sweating, take a candy or something sugary (juice or whatever) to overcome this situation. - Consult your doctor to adapt the medications and respective dose according to your body needs. 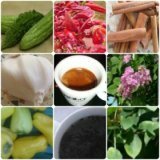 Keep on doing the good job of controlling blood sugar, especially by using natural means.